Before Jesus came, God worked through a chosen nation. He needed Israel for two key reasons. God needed a place on earth where he had authority to operate freely. That place was the promised land. God wanted Israel to demonstrate the benefits of living under his law. If Israel had applied God’s system of government, local judges applying his law, the nations would have seen how well it worked and copied it. Israel failed to live up to its calling. They rebelled against God and went into exile. The promised land was ruled by foreign empires: Babylon Persian, Rome. God’s authority to operate in the land was significantly constrained. He had to wait a long time before it was safe to send Jesus. Israel rejected God’s system of government and chose to be ruled by a king, like the other nations. The wisdom of God’s law was never demonstrated. This difficulty did not hold God back, because it was only the first step in his plan. He sent Jesus to get the second stage of his plan underway. Jesus did not come to restore the chosen nation, although that was what was expected (Acts 1:6). The chosen nation was just a step on the way to God’s much greater plan for redeeming the entire world. Jesus announced the Kingdom of God, which is a much broader concept than a chosen nation, because the Kingdom of God covers the entire earth. Jesus did attempt to restore the chosen nation. He announced that it would be destroyed soon after his ministry on earth was complete and the Kingdom of God had been inaugurated (Luke 20:9-15; 21:20-24). 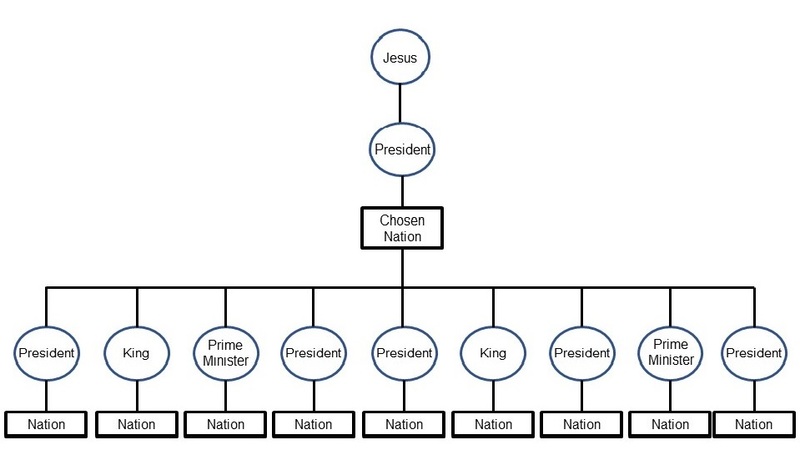 Jesus explained that the Kingdom of God does not need a chosen nation, because it would be within them (Luke 19:21). This does not mean that it is invisible. Rather the Holy Spirit is within each believer, telling them Jesus’ will and empowering them to obey it. God’s kingdom comes as Jesus will is done. Jesus’ will is done, as people obey the leading of the Holy Spirit. When Jesus ascended into heaven, he poured out the Holy Spirit. The Holy Spirit did not just come on the chosen nation. Rather, Jesus poured out the Holy Spirit on people from all the nations who had gathered in Jerusalem (Acts 2:5-11). They would take the gospel of the Kingdom back to their homes and spread the Kingdom of God into all the word. They would teach the people of the nations to do Jesus’ will (Matt 28:20). The outpouring of Pentecost and the inauguration of the Kingdom of God made the chosen nation redundant. A few years later, in AD 70, the chosen nation was destroyed by the Roman Empire and the Jewish people scattered among the nations into exile. A chosen nation was no longer needed, because the Kingdom of God had come. God no longer needed a piece of land on earth in which to work, because the Holy Spirit could work in people all over the world. He would be a river of living water flowing out from within them into the surrounding people (John 7:38). The ministry of Jesus shifted God’s scope of activity from a small piece of land to the entire earth (Matt 28:19). God will eventually save the chosen nation, but not by restoring them as a nation with their own king. Instead, they must become part of the Kingdom of God, through trusting in Jesus, and obeying the Holy Spirit (Rom 11:26). The chosen nation no longer responsible for bringing salvation to the world (apart from proclaiming the gospel of the Kingdom). Rather it finds salvation by coming into the Kingdom of God. God has been happy to let his Kingdom run on for 2000 years without appointing a replacement chosen nation. Clearly, his kingdom can function without one. Not that different people have not tried to become a chosen nation for him. The kings of the Holy Roman Empire thought they were the chosen nation for a couple of hundred years. Then the people of British thought they were the chosen nation. Now many people in the United States assume that it is the chosen nation. Some believe that the United States and Israel have this role together. The truth is that when God scattered Israel amongst the nations, he did not appoint a chosen nation to replace (except in the sense that all citizens of the Kingdom of God are a chosen nation (Rev 1:6)). Many people have a distorted view of the Kingdom of God. They think it looks something like this. They assume that the Kingdom of God comes into reality when the King or President is a Christian, or at least lead by God. This is why contesting elections have become such an important objective. The problem with this view is the duplication of kings. A kingdom cannot have two kings. If Jesus is the king of the Kingdom of God, then other kings cannot have a role in his kingdom. A kingdom with multiple kings will be a divided kingdom, that cannot stand. Some Christians actually think that the Kingdom of God looks like this. They assume that God wants the chosen nation controlling all the other kings and nations of the world. For many people, the chosen nation is the United States. God has chosen it to dominate the world to make it a better place. This view does not come out very well in the book of Revelation. In John’s vision, the chosen nation is the woman and the nation that controls the other nations of the world is the Beast (Rev 17:1-6). The woman is Israel (Rev 12:1-6), and the Beast might be the United States. Israel has become a powerful nation that dominates the nations of the world. 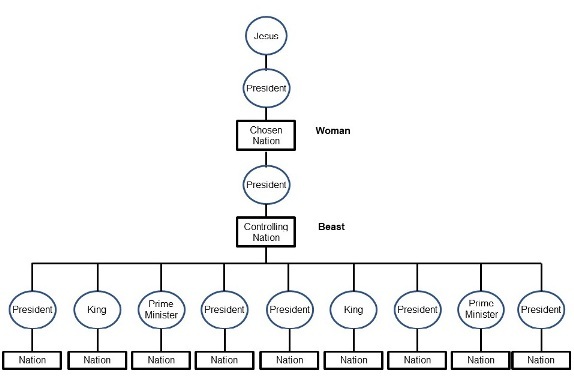 Actually, there is no hierarchy of power in the Kingdom of God. It looks like this. The Holy Spirit can speak to every follower of Jesus. They can all hear his voice and know Jesus will. They do not need another person to tell them what Jesus is saying. 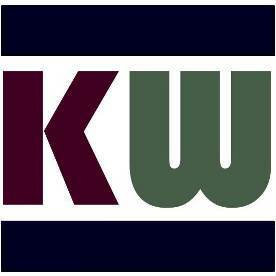 Distinctions between nations break down, as loyalty to nations is replaced by loyalty to Jesus. Citizens of the Kingdom have no nation. The only special role in the Kingdom of God is that of elders (some are pastors, some are apostles, some are evangelists, some are prophets, others are judges). Their role is to serve the people that God has entrusted to them. This mostly involves watching from a distance, praying for them, giving advice and warning about possible mistakes. The elders do not control the people they are caring for. Their only authority is what people have freely submitted them. Because it is freely submitted, it can be freely taken away again at any time. So the Kingdom of God really looks like this. The elders are underneath because their role is to serve the people. That have no authority, except what people gave to them. After Peter and John were released from prison, they prayed and quoted a prophecy by David. and against his anointed one (Acts 4:25-26). Peter understood that the rulers of the nations are opposed to God’s purposes. God responded to the prayer by re-filling them with the Holy Spirit. After they prayed, the place where they were meeting was shaken. And they were all filled with the Holy Spirit and spoke the word of God boldly (Acts 4:31). God was doing something much bigger than the nations and their rulers. He was bringing in the Kingdom of God by the power of the Holy Spirit. Many Christians still hope to use the power of the nation state to establish the Kingdom of God. Peter understood that God could do something more powerful through the Holy Spirit.